Barcrest is a well known subsidiary of Scientific Games and a prolific designer of a continuous array of cabinets and game terminals. Although it was founded in 1968, Barcrest is a company widely recognized for the durability, innovation and functionality of its wide range of products. 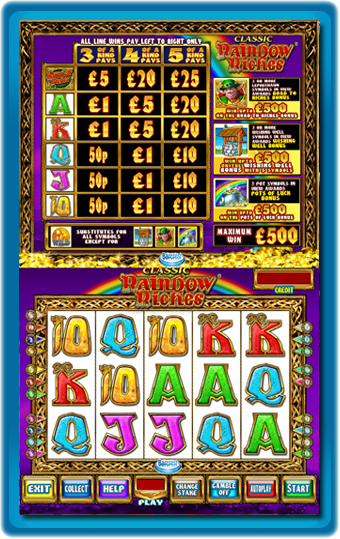 Barcrest Rainbow Riches is a very popular iconic game developed by the company, being an UK category C game type. It was launched on the 18th of February 2008 and since then it has won the hearts of slot game players. Featuring an Irish theme thanks to the leprechauns, the game has 5 reels and 20 paylines. 5 Wild God Leprechaun Coins will get you a 500 coin jackpot. The jackpot may not be the greatest thing about this game, but the 3 bonus rounds sure are! The Road To Riches bonus round is the first one to come up when you get 3 to 5 Leprechaun Bonus symbols. You can get up to 500 times your stake in this round. Pressing ‘Start” will spin the wheel and give you the number of steps you move up the cash path. Your stake will be multiplied when you either land on a collect position or reach the top of the path. The second bonus round is the Wishing Well Bonus round that can be accessed when getting 3 or more Wishing Well symbols. Select a wishing well by clicking on it and keep in mind that each well has a multiplier value that multiplies your stake. This bonus round also makes possible winning up to 500 times your stake. Pots of Gold Bonus round is the last one. It can be triggered when you get 3 Pots of Gold symbols in reels 2, 3 or 4. There will be Gold, Silver and Bronze pots spinning around the screen and when they stop spinning, an arrow will point to one of these pots, revealing a multiplier value that goes up to 500 times your stake. Barcrest Rainbow Riches offers a payout of 95% and it is easy to see why it is widely appreciated by slots lovers all around.